I covered a Muskegon Risers game on Saturday night, and I have to admit that in the days leading up to the contest, I wasn’t terribly excited about it. That was just because the Risers were 1-9 going into their last home game of the indoor soccer season at L.C. Walker Arena. Their opponent, the first-place and defending champion Chicago Mustangs, were 9-1. The week before the Risers lost to a team that was not in first place, 17-4. So I suspected Saturday’s game would be another ugly one, and a grim way to spend a chunk of the weekend. It turned out to be a great game. The Risers gave Chicago everything it could handle, and only lost 7-6. There was another good crowd, too, which surprised me, considering it was the last home game of the season, and there hadn’t been any home victories at all. But I had no way of knowing it would be an entertaining game, played in front of a nice crowd. 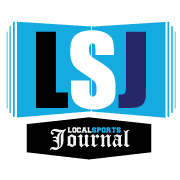 LocalSportsJournal.com was going to cover the game either way, with a reporter and photographer, because of our long-term commitment to cover our community teams that play at L.C. Walker Arena. That’s why we’re introducing a simple new logo, which you can see displayed to the left. It’s our “LSJ/L.C. Walker Arena” logo, and it will be embedded in all of our future stories about the teams that play at the arena. Since LSJ began, more than five years ago, we’ve had live coverage of every Muskegon Lumberjacks home game, in the regular season and playoffs. We’ve done the same for the West Michigan Ironmen arena football team, as well as the Risers when they started playing indoors a few years ago. While the Risers’ indoor home season has come to an end, LSJ will be there when the Ironmen open their 2019 season on Saturday night at home. And of course we will stay on top of the Lumberjacks’ exciting push for their first Clark Cup championship. We are the only local media outlet that has live reporter/photographer coverage (almost always two different people) of all those arena games. The LSJ reporter is almost always the only local reporter in the press box. That commitment has been challenging to maintain at times, because we are a small-staff, small-budget company, and most of our time is spent covering the 20-plus high schools in our area. We haven’t even reached the point where we can cover all the many varsity sports at those schools, and that remains a goal. Yet we’ve kept our commitment to cover Walker Arena games, because we believe those events provide a unifying element for our community, and are good for Muskegon and its economy. We think the arena – particularly with its nice new renovations – is a critical facility to maintain for the community, and the teams playing there help keep it financially viable. We also believe all Muskegon media outlets that cover sports should make a priority of providing live coverage of Walker Arena teams. Maybe stories about those teams don’t always get as many computer clicks as stories about high school teams, but local media has a responsibility to cover local events, period. How can any event that draws 2,000-3,000 people in Muskegon not be worthy of live news coverage? Maybe the difference is that we are a locally-owned and operated company, not part of any national or regional corporate chain, and we don’t base our coverage decisions on computer metrics. Our job is to cover sports in the community, and we work hard to get it done. When you notice our “LSJ/L.C. Walker Arena” logo, you will know we were there.